You think you know grilled cheese, but I’m certain you don’t. 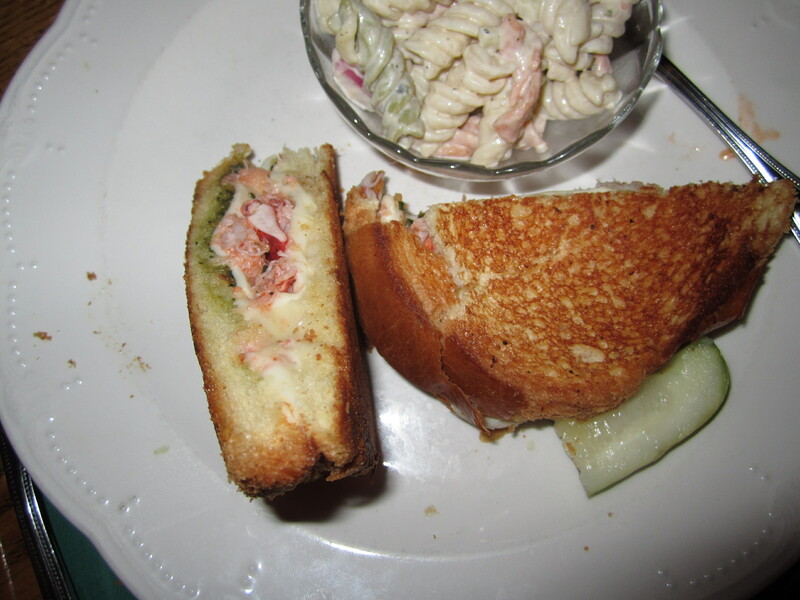 The Tavern at Dan’l Webster Inn, located in Sandwich, MA (Cape Cod), features a lobster grilled cheese. Set apart on the menu–centered, near the bottom as though the other dishes are its modest preamble–and proudly noted, “Voted Best Sandwich in Sandwich” you can’t miss it. When I first heard about the lobster grilled cheese, I imagined cheddar or American cheese, sorely underestimating the culinary aspirations of the rustic Tavern. Two perfectly toasted pieces of white bread cradle melted brie and a dash of dill with a layer of pesto lining the upper slice. Fresh lobster, chopped into soft geometric pieces, fills the middle portion of the sandwich. If you think that’s heavenly, you’ll find their lobster chowder and lobster roll absolutely transcendent. Prior to my visit to Cape Cod, I hadn’t ever eaten lobster. To put it mildly, I went lobster-wild at the Tavern. The grilled cheese was an obvious choice, but we needed another dish. We chose half a lobster roll with lobster chowder. First, the lobster roll. It was exactly what a lobster roll should be. 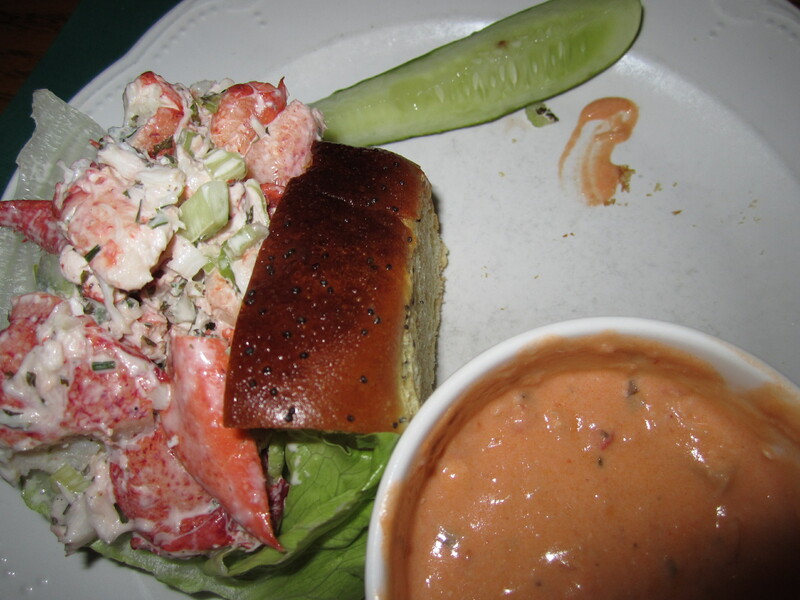 A crusty, lightly poppy-seeded bun was dwarfed by a portion of lobster salad meant for a larger or second roll. The salad itself had big chunks of chowder lubricated with just-enough mayonnaise. When I look at pictures of lobster rolls, I either see too much white or too much red. Check out this lobster salad. To New York lobster pounds: THIS is the right color. Next, the lobster chowder. Thick and creamy, with sizable, succulent pieces of lobster. Still tongue-tied, I’m not sure what more I can say. I’ve never had anything like it. I doubt I ever will. Next time you go to Cape Cod (or even Boston–seriously), take a detour to Sandwich for the best sandwiches and chowder you’ll ever have. One more recommendation? Don’t bother with Ice Cream Sandwich. Like you, I wanted an ice cream sandwich from Sandwich. All I got was a coffee ice cream Chipwich wannabe. Overall, I found that the best thing to eat on Cape Cod is lobster. And Portuguese Soup.